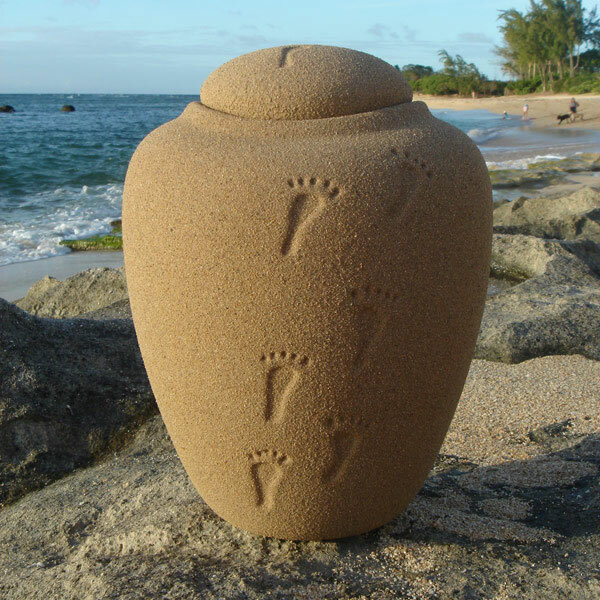 The Biodegradable Sand Urns are made from real beach sand and gelatin, materials that are safe for our environment. Each urn is hand crafted by professional artisans who put their energy and love into every urn. To see how beautiful this urn is in a natural coastal setting, click on Detailed Images. The ashes are placed in a water soluble bag (included with the urn) and the biodegradable bag of ashes is then placed in the urn. No glue is needed to seal the urn. To seal the lid, carefully moisten the lid bottom and attach it to the urn which allows it to seal itself. Small holes in the bottom allow the urn to float briefly before gradually sinking. When buried in the ground, the urn will biodegrade within about three months, depending on the depth of burial and the wetness of the soil. Once placed in water, the urn will break down in about three days depending on the salinity and temperature of the water. This urn will keep indefinitely as long as it is kept inside in a dry environment. All our urns are carefully packaged and this urn in particular is safe for air travel and can be carried onto most commercial airliners. Included with each urn is a biodegradable bag into which the cremated remains must be placed before land or water burial. The plastic bag received from the crematory is not biodegradable.